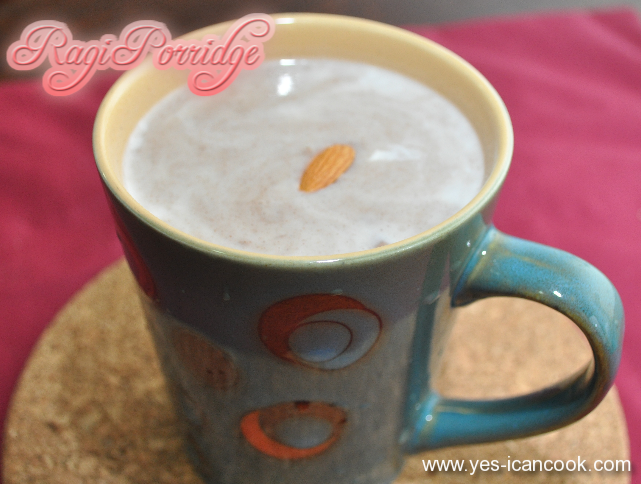 Ragi porridge is a tasty, healthy and power packed breakfast option. I make it for my toddler too. The porridge can be made either sweet or salted as desired. Ragi flour is easily available in all supermarkets and convenience stores. Try to get from a named brand as ragi flour is very often adulterated with rice flour. If you have had ragi before you will immediately note the difference in the taste of the adulterated flour. My mother never buys ragi flour. She buys whole ragi grains, cleans them, washes them, dries them under the sun on a cloth and grinds them in the local flour grinder or mill. I am not too sure if the tiny grains will grind at home in a mixer. 1. In a small mixing bowl add the ragi powder. Add water to it and mix well to combine the powder without any lumps into a thin and runny mixture. 2. There are several ways to proceed cooking it to a porridge but here is what I do. Using a fine mesh I pass the ragi and water mixture into another bowl. Swirl with a spoon to enable the liquid to pass through leaving behind the husk. I repeat this step twice. It is completely optional. Removing the husk makes a smoother porridge. 3. Transfer the liquid to a small saucepan, add almond powder if using and a pinch of salt and cook with continuous stirring on medium low flame. 4. The liquid will come to a boil and then will start to turn thick. Keep stirring to avoid lumps or sticking to the bottom and sides. 5. When the mixture turns into custard consistency, switch off flame. It will further thicken on cooling down. 6. Add the optional ingredients as required to flavor the porridge and to turn it to the desired consistency. Treat your taste buds by flavoring it as desired. 7. 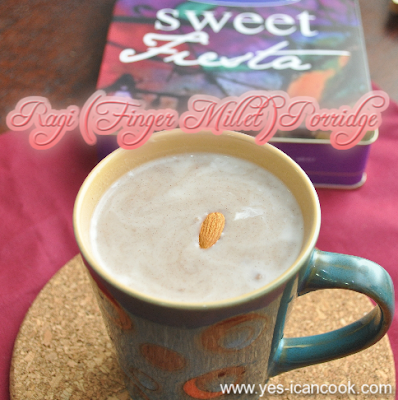 Sweet porridge is made by adding warm milk, sugar or jaggery or honey. I often add a mashed ripe banana and dates honey along with milk. 8. Savory porridge can be made adding buttermilk and salt and spices of choice. You can even add masala buttermilk. You can do a simple tempering or tadka. 9. You can thin it down and enjoy it as a drink instead of a porridge if desired.